For other uses, see Death on the Nile (disambiguation). 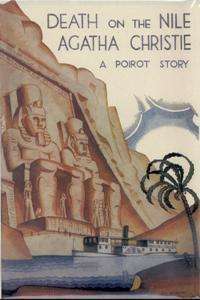 Death on the Nile is a book of detective fiction by Agatha Christie and first published in the UK by the Collins Crime Club on 1 November 1937 and in the US by Dodd, Mead and Company the following year. The UK edition retailed at seven shillings and sixpence (7/6) and the US edition at $2.00. The full length novel was preceded (1937) by a short story with the same title, but with Parker Pyne as the detective. The details of the short story's plot are substantially different, though the settings and some of the characters are very similar. The book features the Belgian detective Hercule Poirot. The action takes place in Egypt, mostly on the Nile River. While dining out in London one evening, Hercule Poirot sees a young woman, Jacqueline de Bellefort ("Jackie"), dining and dancing with her fiancé, Simon Doyle. He also notices that Jackie is passionately in love with Simon, perhaps too much. Jackie's father was a French Count, the Count de Bellefort, and her mother was American. Her father had an affair and ultimately ran away with his mistress. Her mother lost all her money in the Wall Street Crash, leaving Jackie penniless. The next day, Jacqueline takes Simon to meet her best friend, wealthy heiress Linnet Ridgeway, in the hopes that Linnet will offer Simon a job. Three months later, Simon has broken off his engagement to Jacqueline and has married Linnet instead. Poirot happens to encounter the couple on their honeymoon to Egypt, where he himself is on holiday. At their shared hotel in Cairo, Poirot sees an apparent chance meeting between the Doyles and Jacqueline. During the encounter, the Doyles seem very much on edge. Afterwards, Linnet approaches Poirot and confides that Jacqueline has been stalking them since the wedding and antagonising both of them. While Simon was originally with Jacqueline, he fell in love with Linnet upon meeting her. Linnet and Simon are growing increasingly distressed, wishing Jacqueline would leave them alone. Poirot says the Doyles have no legal recourse, but tries to reason with Jacqueline in private, urging her to let go of her attachment to Simon and not "open [her] heart to evil." She refuses to listen, saying that Linnet stole Simon from her by dazzling him with her wealth. Jacqueline confides that she has been dreaming of killing Linnet and she even brings a small pistol out of her purse to show Poirot. A Central European physician (possibly Austrian, German, Swiss or Czechoslovakian) named Dr. Bessner. While taking a tour of some ancient ruins, a boulder falls from a cliff, narrowly missing Linnet and Simon. They suspect Jacqueline at first, but find out she was on the boat the whole time and could not have done it. Poirot meets his friend Colonel Race, who is joining everyone on the boat for the return trip. Race tells Poirot that one of the passengers is a deadly criminal who has murdered several other people, only Race has not yet identified him. That night on the boat, Jacqueline enters the lounge where Simon and Linnet are playing bridge with other passengers. Jacqueline begins ordering drinks and downing them very quickly. Linnet and many of the others depart, leaving only Jacqueline, Simon, Cornelia Robson, and Mr. Fanthorp in the room. Jacqueline drunkenly tells Cornelia of how Simon left her for Linnet. Simon tries to calm Jacqueline down, but to no avail. She takes out her pistol and shoots him in the leg, then breaks down in a hysterical state of remorse, threatening to take her own life. At Simon's insistence, Cornelia and Mr. Fanthorp help Jacqueline back to her cabin, and then fetch Dr. Bessner to see to Simon's wound. Nurse Bowers stays in Jacqueline's room all night. Later, Fanthorp tells Bessner the gun is missing. The PS Sudan was used in the Agatha Christie's Poirot version of the story (Starring David Suchet) in 2004. Linnet is found the next day in her cabin, shot in the head while sleeping. Race takes charge of the situation and asks Poirot to handle the investigation. Several clues seem to incriminate Jacqueline – a "J" written in blood on the wall above Linnet's head, for instance – but Miss Bowers assures Poirot that Jacqueline was under sedation and never left her cabin that night. Dr. Bessner explains Linnet couldn't have written the "J" in her own blood because the gunshot would have killed her instantly. He also assures Poirot that Simon's leg wound completely incapacitated him, and so he could not have moved from his bed, even if he wanted to. Race and Poirot theorise that Linnet had some other enemy among the passengers, who took advantage of the scene in the lounge. The unknown person stole the pistol after everyone had gone, shot Linnet, and left behind evidence to implicate Jacqueline. Poirot also notices that Linnet's pearl necklace is missing from her room. When questioned, Simon reveals that Linnet's father, Melhuish Ridgeway married a girl called Anna Hartz the daughter of a multi-millionaire, Leopold Hartz. As of the marriage, Melhuish started to shrewdly play the markets, building his own fortune while financially ruining several people. Of the guests aboard, there is someone whose father was one of those who lost everything. Poirot then interviews all the passengers. Several describe hearing a faint "pop", similar to the sound of a bottle of champagne being opened. Others tell of hearing a splash shortly after midnight. Miss Van Schuyler claims she looked out her door and saw Rosalie Otterbourne at the railing, having just thrown something overboard. She also complains that her velvet stole has gone missing. Rosalie denies leaving her cabin. A short time later, the murder weapon is recovered from the Nile – Jacqueline's pistol, wrapped in Miss Van Schuyler's missing stole. This makes no sense to Poirot. If someone wanted to incriminate Jacqueline, it would be more logical to leave the gun behind. Linnet's maid Louise Bourget is interviewed in Dr. Bessner's cabin, while Bessner is tending to Simon. She says she saw nothing on the night of the murder, but would have done "if" she had left her cabin. This choice of words sounds strange to Poirot. Louise reveals that her predecessor Marie wanted to marry an engineer on the boat named Fleetwood, but Linnet had discovered he was a married man with three children, and so Marie ended the relationship. Fleetwood vowed vengeance, stating he would kill Linnet. Simon asks Poirot to speak with Jacqueline and is very sorry for shooting him. Despite everything that has happened, she is still very much in love with him. Poirot, hoping for closure, gives them some privacy. When Race announces that the cabins will be searched for the missing pearls, Miss Bowers returns them, confiding that Miss Van Schuyler took them from Linnet's cabin, being a secret kleptomaniac. Poirot examines the necklace and finds it is a fake, meaning the real pearls were stolen sometime earlier. Poirot eventually realizes that Salome Otterbourne is a secret alcoholic, and what Rosalie was throwing overboard was her mother's hidden cache of spirits. Rosalie admits this, but firmly denies seeing anyone leaving Linnet's cabin on the night of the murder. Louise is found murdered in her cabin, stabbed to death and clutching a fragment of a large-denomination banknote. Race and Poirot deduce she must have seen the real murderer leave Linnet's cabin and that she was trying to blackmail him/her. While no weapon is left behind, the wounds Louise suffered could only have been caused by a strong slender blade, much like a scalpel. Dr. Bessner balks at the suggestion that one of his instruments was used to commit the murder. Poirot and Race enter Dr. Bessner's cabin to tell the doctor and Simon what happened. Salome Otterbourne enters and declares she knows who killed Linnet and Louise because she saw the person enter and leave Louise's cabin. Simon yells at her to tell him. Before she can finish her story, a shot is fired from the deck outside, hitting her. Before Poirot and Race can get outside, the shooter is gone, having dropped a gun that Poirot recognises from Andrew Pennington's luggage. The circumstances of Louise and Mrs. Otterbourne's deaths. Andrew Pennington admits that he has speculated, illegally, with Linnet's holdings; he was hoping to replace the funds before she came of age, but upon her marriage she gained full control of her estate; on learning of her marriage, Pennington rushed to Egypt to stage a "chance" encounter with Linnet and dupe her into signing legal documents that would exculpate him; he abandoned the plan when he found that Linnet was a shrewd woman who read anything she was asked to sign in detail; in desperation, he tried to kill her by dislodging the boulder at the temple, but that is as far as he went, and he swears that he did not shoot her. Poirot discovered this by learning on Pennington's passport that he actually sailed on the "Normandie", which sailed two days after the ship that Pennington was supposed to have sailed on, the "Carmanic" (and a few days after the letter announcing Linnet's marriage arrived in New York). Fanthorp is revealed to be a young attorney with Linnet's British solicitors, who sent him to Egypt to spy on Pennington, suspicious of his intentions. Tim is exposed as a society jewel thief, working in partnership with his cousin Joanna, a down-on-her-luck socialite and friend of Linnet. Tim stole the pearls from Linnet's cabin that night and substituted the fake string for them, but, likewise, swears he didn't kill her; he does not know if Linnet was already dead when he entered her cabin; Rosalie admits that she saw Tim enter and leave Linnet's cabin, but she has come to love him, and was trying to protect him; Poirot clears Tim of the murder and agrees not to report his thievery to the police; Tim promises to reform and happily asks Rosalie to marry him, to the delight of his mother. Signor Richetti is exposed as the foreign agent and criminal Race is after, after Race hears of a telegram Richetti received, using a code that Race recognises. Poirot finally explains the real mystery to Race, Miss Robson, and Dr. Bessner. Their first idea, that the murder was conceived on the spur of the moment after the scene in the lounge, was mistaken; in fact, the murder was planned months in advance – by Jacqueline and Simon. Before the murder, either Jacqueline or Simon drugged Poirot's usual bottle of wine, ensuring that he would sleep soundly through the night. Jacqueline used Cornelia Robson as a witness and pretended to shoot Simon in the leg. In reality, the shot missed completely and Simon faked being wounded with red ink, having put the ink in Linnet's nail polish bottle, hidden in his pocket. While Cornelia left with Jacqueline and Jim Fanthorp called for Dr. Bessner, Simon was completely alone in the lounge. He picked up the gun and ran to Linnet's cabin, which was on the starboard side of the boat. Cornelia and Mr. Fanthorp brought Jacqueline to Dr. Bessner and Miss Bowers' cabins, which were on the port side, theoretically eliminating any concerns of witnesses. Simon shot Linnet in her cabin as she slept, wrote the letter "J" on the wall in blood, deposited the now empty nail polish bottle, ran back to the lounge, and shot himself in the leg. He used the velvet stole as a makeshift silencer so no one would hear the shot. He reloaded two bullets back into the gun to make it look like it had been fired only once, wrapped it in the stole, and threw the bundle overboard. Dr. Bessner would examine him and confirm that his wound would have left him unable to leave the lounge, giving him a perfect alibi. Unfortunately, Louise the maid saw Simon enter and leave Linnet's cabin. She blackmailed Simon and demanded money in exchange for her silence. Simon told Jacqueline about this during their private moment together. Jacqueline stole one of Dr. Bessner's scalpels and entered Louise's cabin under the pretense of dropping off the blackmail money, stabbing her while it was being counted. However, Mrs. Otterbourne saw Jacqueline entering the maid's room. Believing that Linnet and Louise's killer must have been one and the same, Mrs. Otterbourne ran to Simon and Poirot to divulge what she had seen. Simon, feigning concern, yelled at Mrs. Otterbourne loudly enough for Jacqueline to hear that their plan was in danger of being exposed. Jacqueline quickly ran into Pennington's nearby cabin, fetched his gun, and shot Mrs. Otterbourne. Poirot explains his suspicions were first piqued when Louise spoke hypothetically about seeing someone enter Linnet's cabin on the night of the murder. He deduced the only reason she wouldn't definitively answer the question was because the murderer was in the room and she was hoping to make some money through blackmail. Aside from Poirot himself and Colonel Race, the only people present were Dr. Bessner and Simon. Louise could have spoken to Dr. Bessner at any time, however, so it was hardly necessary for her to broach the subject in front of others. Therefore, she must have been trying to get Simon's attention, since his condition was being closely monitored and she might not get a chance to speak to him again. Poirot's suspicions were also aroused by the fact that Miss Van Schuyler's stole had a hole through it, meaning it had been used to silence a shot. This was strange because Linnet's bullet wound had scorching around it, meaning the gun had been held close against her head. If the stole had been used to muffle the sound of the gun going off, there would have been no scorching. The fact that other people reported hearing the popping sound later discovered to be the fatal shot further cements this theory. Since there were witnesses who could prove the stole hadn't been used when Simon was "shot", it meant there must have been a third shot nobody knew anything about – the shot that Simon fired into his own leg following the murder of his wife. Poirot notes that on the night of the murder, he slept quite soundly, when he usually sleeps lightly. This led to his deduction that his wine was drugged, preventing him from interfering with the night's events. Poirot's bottle of wine at dinner being drugged also spoke to premeditation, not a crime that was done at the spur of the moment, which started him down the path that would lead him to the solution. Confronted, Simon and then Jacqueline confess to the plot. Jacqueline says that she and Simon have always been in love, and that Simon never cared for Linnet. The whole marriage had been an act so Simon would inherit her money. After a suitable mourning period, Simon and Jacqueline would appear to reconcile and eventually marry. Jacqueline tells Poirot it was Simon's idea to murder Linnet but that she planned it, knowing Simon was not smart enough to pull it off by himself. He had previously attempted to steal some money from his employers, but was caught and subsequently fired. Planning a crime on such a grand scale was beyond his capabilities. Jacqueline was the woman with the ideas and Simon was the man of action. Together, they planned a nearly perfect crime. Jacqueline also admits Linnet did genuinely try to steal Simon away from her, which is why she doesn't regret coming up with the plan, although she was glad she didn't have to be the one to kill her. As the passengers disembark, Jacqueline reveals a second pistol, which she had previously hidden in Rosalie Otterbourne's handbag while the boat was being searched. She kills both Simon and herself, sparing them both from more gruesome and humiliating deaths. Poirot confesses that he knew about the second pistol, and wanted to give Jacqueline the chance to take a more humane way out. In addition to Tim and Rosalie, there is another unexpected love match: Cornelia Robson accepts Dr. Bessner's proposal, to the stupefaction of Mr. Ferguson, who had been courting her, in his own uncouth way, during the whole trip. It also emerges that Mr. Ferguson is an alias and that he is in fact a member of the nobility, who became interested in communism whilst studying at Oxford. The Times Literary Supplement's short review of 20 November 1937 by Caldwell Harpur concluded, "Hercule Poirot, as usual, digs out a truth so unforeseen that it would be unfair for a reviewer to hint at it". In The New York Times Book Review for 6 February 1938, Isaac Anderson concluded after summarising the set-up of the plot that, "You have the right to expect great things of such a combination [of Agatha Christie and Hercule Poirot] and you will not be disappointed.". In The Observer's issue of 14 November 1937, "Torquemada" (Edward Powys Mathers) started off by saying, "First this week comes Agatha Christie. She scored, I contend, two outers in her last three shots; but she is back on the very centre of the bull with Death on the Nile." He summarised the set-up of the plot and then continued, "Terrible things happen and, without the formality of breaking off her narrative to issue a challenge, the author allows Poirot to summarise his clues in one compressed paragraph sixty pages from the end. It is after that, until the retired but by no means retiring little Belgian chooses to tell us the truth, that we are very angry with ourselves indeed. When he does so, anger is swallowed up in admiration. The appearance of corpse after corse [sic!] in the feast of death is entirely logical, and the main alibi, unshakeable except for Poirot, is of the first brilliance. It is no less likely than the run of such things in fiction, and is built not with many preliminary falsifications but almost in a single carefully premeditated flash of movement." He concluded, "Though less than secondary, the descriptive work is adequate and hits, as it were, the Nile on the head." The Scotsman of 11 November 1937 said, "An Agatha Christie story, and especially one with Hercule Poirot applying his 'little grey cells,' is always an event. It is a matter of opinion whether this author has a superior in giving an unexpected twist to concluding chapters, but it is arguable that she has none. In Death on the Nile, however, the solution of the mystery does not come with all that sudden shock of surprise to which Agatha Christie 'fans' are accustomed. At least it should not, providing that one carefully reads a certain chapter and is willing to pursue to their ultimate implications certain hints dropped by Poirot. Whether or not the reader will succeed in naming the murderer, by which is meant discovering how the crime was committed, and not just guessing at one of the least likely persons, is another matter. In any case, here is a problem eminently worth trying to solve." The review finished by saying that, "the author has again constructed the neatest of plots, wrapped it round with distracting circumstances, and presented it to what should be an appreciative public. E.R. Punshon of The Guardian in his review of 10 December 1937 began by saying, "To decide whether a writer of fiction possesses the true novelist's gift it is often a good plan to consider whether the minor characters in his or her book, those to whose creation the author has probably given little thought, stand out in the narrative in their own right as living personalities. This test is one Mrs. Christie always passes successfully, and never more so than in her new book." He went on to summarise the more outlandish traits of some of the characters and then said, "each and all of these, as well their more normal fellow-passengers, are firmly and clearly sketched, even if they are all a little too much types rather than characters and so miss that full rotundity of life a Dickens or a Thackeray can give." He finished by saying that, "M. Poirot's little grey cells had indeed been obliged to work at full pressure to unravel a mystery which includes one of those carefully worked out alibis that seem alike to fascinate Mrs. Christie and to provide her with the best opportunities for displaying her own skill. A fault-finding critic may, however, wonder whether M. Poirot is not growing just a little too fond of keeping to himself such important facts as the bullet-hole in the table. If he is to enjoy all, a reader should also know all." Mary Dell in the Daily Mirror of 11 November 1937 said, "Agatha Christie is just grand. Usually if you get a good plot there is something wrong with the writing or the characters. But with her – you have everything that makes a first-class book." Robert Barnard: "One of the top ten, in spite of an overcomplex solution. The familiar marital triangle, set on a Nile steamer. Comparatively little local colour, but some good grotesques among the passengers – of which the film took advantage. Spies and agitators are beginning to invade the pure Christie detective story at this period, as the slide towards war begins." In Chapter 12, Miss Van Schuyler mentions to Poirot a common acquaintance, Mr Rufus Van Aldin, who is known from The Mystery of the Blue Train. In Part II, Chapter 21 of the novel, Poirot mentions having found a scarlet kimono in his luggage. This refers to the plot in Murder on the Orient Express. When Poirot meets Race, Christie writes: "Hercule Poirot had come across Colonel Race a year previously in London. They had been fellow-guests at a very strange dinner party—a dinner party that had ended in death for that strange man, their host." It is a reference to the novel Cards on the Table. About to reveal the identity of the murderer, Poirot credits the experience recounted in Murder in Mesopotamia with developing his methods in detection. He muses: "Once I went professionally to an archaeological expedition—and I learnt something there. In the course of an excavation, when something comes up out of the ground, everything is cleared away very carefully all around it. You take away the loose earth, and you scrape here and there with a knife until finally your object is there, all alone, ready to be drawn and photographed with no extraneous matter confusing it. This is what I have been seeking to do—clear away the extraneous matter so that we can see the truth..."
Agatha Christie adapted the novel into a stage play which opened at the Dundee Repertory Theatre on 17 January 1944 under the title of Hidden Horizon and opened in the West End on 19 March 1946 under the title Murder on the Nile and on Broadway on 19 September 1946 under the same title. A live television version of the novel under the name of Murder on the Nile was presented on 12 July 1950 in the US in a one-hour play as part of the series Kraft Television Theatre. The stars were Guy Spaull and Patricia Wheel. The novel was adapted into a highly successful feature film, released in 1978 and starring Peter Ustinov for the first of his six appearances as Poirot. Others in the all-star cast included Bette Davis (Mrs. Van Schuyler), Mia Farrow (Jacqueline de Bellefort), Maggie Smith (Miss Bowers), Lois Chiles (Linnet Doyle), Simon MacCorkindale (Simon Doyle), Jon Finch (Mr. Ferguson), Olivia Hussey (Rosalie Otterbourne), Angela Lansbury (Mrs. Otterbourne), Jane Birkin (Louise), George Kennedy (Mr. Pennington), Jack Warden (Dr. Bessner) and David Niven (Colonel Race). Slight plot changes were made to the screenplay, deleting several characters, including Cornelia Robson, Signor Richetti, Joanna Southwood, the Allertons and Mr. Fanthorp. Tim Allerton is replaced as Rosalie's love interest by Ferguson. The novel was adapted as a five-part serial for BBC Radio 4 in 1997. John Moffatt reprised his role of Poirot. The serial was broadcast weekly from Thursday, 2 January to Thursday, 30 January at 10.00am to 10.30pm. All five episodes were recorded on Friday, 12 July 1996 at Broadcasting House. Some characters were omitted, such as Miss Bowers, Mr. Fanthorp and the Italian archaeologist; the removal of Richetti changes Race's reason for boarding the boat – he had been on a diplomatic mission before meeting Poirot, and decided to use it rather than a government vessel. The romance between Tim and Rosalie is changed slightly, in that instead of ending up happily in love, Tim gently refuses Rosalie and the film implies ambiguously that he is either gay or in a relationship with the woman who may or may not actually be his mother. Louise Bourget's body is found in her wardrobe instead of under her bed. Rather than a boulder dropped from a cliff missing Linnet and Simon, the pair are nearly hit by a piece of masonry from the roof of an old temple that is visited by them and the others. Andrew had knocked it off the roof accidentally, but not in desperation and with the intent to kill, which he does in the novel. Jacqueline is not on the boat when this happens, nor on the temple's roof, but near Linnet and Simon, taunting them with knowledge about an Egyptian goddess with the features of a cow. The cast included Emily Blunt as Linnet, J. J. Feild as Doyle, Emma Griffiths Malin as Jacqueline, James Fox as Race, Frances de la Tour as Madame Otterbourne, Zoe Telford as Rosalie Otterbourne and David Soul as Pennington. The episode was filmed in Egypt. Many of the scenes were filmed on the PS Sudan. References to real life events set this episode in late 1932 (though S.S. Normandie only entered service in 1935). Death on the Nile was turned into a "hidden object" PC game, Agatha Christie: Death on the Nile, in 2007 by Flood Light Games, and published as a joint venture between Oberon Games and Big Fish Games. The player takes the role of Hercule Poirot as he searches various cabins of the Karnak for clues, and then questions suspects based on information he finds. Death on the Nile was released by HarperCollins as a graphic novel adaptation on 16 July 2007, adapted by François Rivière and Solidor (Jean-François Miniac) (ISBN 0-00-725058-4). This was translated from the edition first published in France by Emmanuel Proust éditions in 2003 under the title of Mort sur le Nil. The book was first serialised in the US in The Saturday Evening Post in eight instalments from 15 May (Volume 209, Number 46) to 3 July 1937 (Volume 210, Number 1) with illustrations by Henry Raleigh.